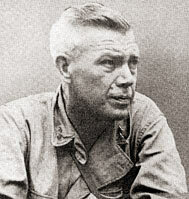 The Pacific War Online Encyclopedia: Patrick, Edwin D.
Patrick was a former National Guardsman who received a commission and served in France in the St. Mihiel and Meuse-Argonne offensives of the First World War. He served as chief of staff of 6 Army and commanded task forces at Wakde and Noemfoor. During the Noemfoor operation, he concluded on the basis of faulty intelligence that there was a substantial Japanese force hidden in the island interior, which prompted him to request a drop of paratroop reinforcements. The drop was a near fiasco. He (the general) was scared of airplanes; that is, scared of their accuracy and lack of ground control. He was polite but absolutely firm. However, Patrick reversed his opinion and become a staunch advocate of close air support after witnessing the effectiveness of an air strike in February 1945. Patrick's chief of staff later claimed that Patrick was a reckless commander, particularly when drunk, which was allegedly much of the time (Hastings 2007). His recklessness eventually cost him his life, when he exposed himself to enemy fire at the front line and was promptly hit by a Japanese machine gunner.